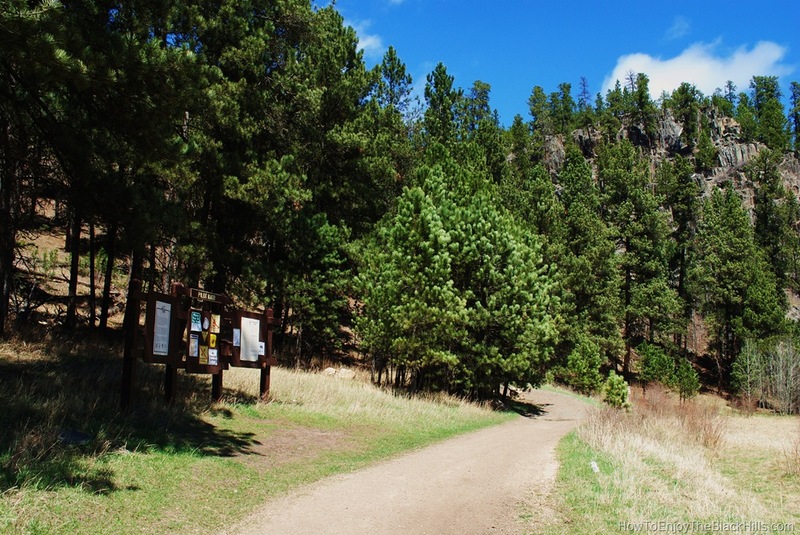 Pilot Knob Trailhead is about 50 miles south of Bear Butte, the start of the Centennial Trail. From here is 3.8 miles south to the Deer Creek Trailhead or 7.6 miles north to the South Boxelder Creek Trailhead near Nemo. A vault toilet is the only service at this trailhead. Be sure you always carry plenty of water when you are using the Centennial Trail, as most Trailheads do not have water. This portion of the trail has lots of exposed slate making this area different than other parts of the trail. Pilot Knob is a great access point for day hikes or mountain bike rides. It is only about 1 mile off Highway 385 on Forest Service Road 208. And, it is just about a mile away from the Sugar Shack. After a long hike or ride you can enjoy burgers at the Sugar Shack. A well deserved treat for a hard day on the trail. If you plan on hiking the Centennial Trail or any other trails in the Black Hills, I encourage you to pick up a copy of Exploring the Black Hills and Badlands: A Guide for Hikers, Cross-Country Skiers, & Mountain Bikers . It has 40 pages just about the Centennial Trail, covers many other trails in the Black Hills and includes good maps. Also Black Hills – Northeast, South Dakota Trails Illustrated Map #751 has the trail and trailheads marked very clearly.